Cheap Monitor Stand Designed for 55" Plasma Televisions For Sale Online! This Monitor Stand is In Stock Now! Buy Online! Mobile TV stands with shelf display electronics or goods on adjustable glass shelf. Steel construction is extremely durable for years of use. Mobile TV stands display 37"-60" television of up to 176 lbs. VESA compatible: 100mm x 100mm, 200mm x 100mm, 200mm x 200mm, 300mm x 300mm, 400mm x 200mm, 400mm x 400mm, & 600mm x 400mm. Spartan TOUGH displays are our highest quality stands, made of steel with a black powder coating. The mobile monitor stands designed for 37"-60" televisions and smaller with shelf are height adjustable and have a glass shelf for holding different electronic equipment. This shelf is adjustable to coordinate with many television sizes. 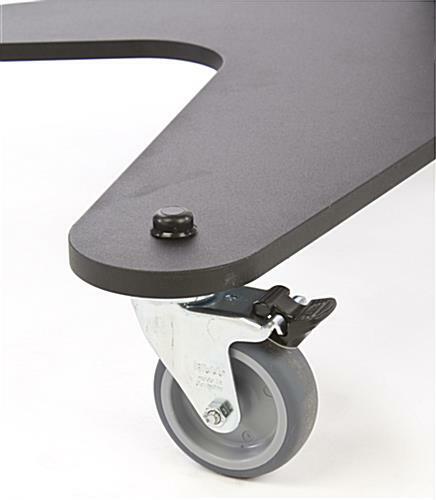 LCD mounts, plasma floor displays, and other mobile monitor stands with shelf are constructed of steel for a durable display that will last through years of use. The television displays are perfectly suited for use at trade shows and conventions for promoting companies and products. This flat panel stand ships unassembled, with tools and instructions included for fast assembly. 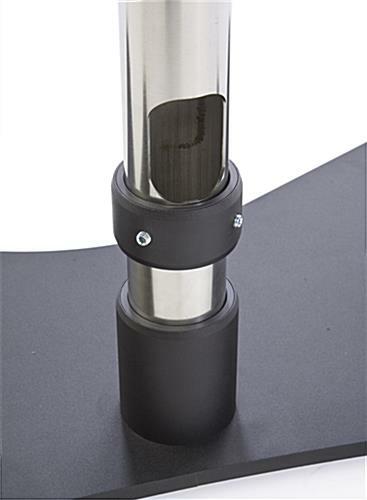 The television floor stand has a black and chrome finish that adds style to any environment! The portable mobile monitor stands with shelf hold a 37"-60" LCD, plasma, or LED flat panel television, weighing up to 176 lbs. The steel display is VESA compatible to hold most makes and models of televisions including Toshiba and Sony. These mobile monitor stands with shelf that have a black finish include the necessary hardware to install most televisions. However, some may need different screws that are available at a local hardware store. The flat screen TV mounts, mobile monitor stands with shelf for trade shows use the adjustable bracket to hang your television at different heights. This bracket also enables your monitor to be angled to provide a better view. This Sparton-tough monitor stand is the ideal choice for heavy tradfic areas. 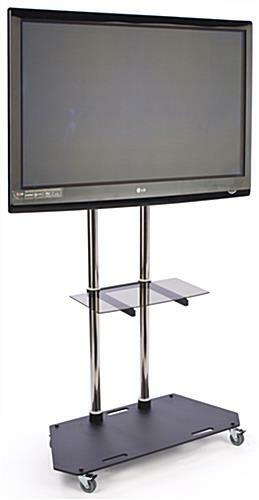 The inexpensive monitor stand for 55" wide screen TV mounts are sold in bulk or by the piece. 41.5" x 71.5" x 19.0"